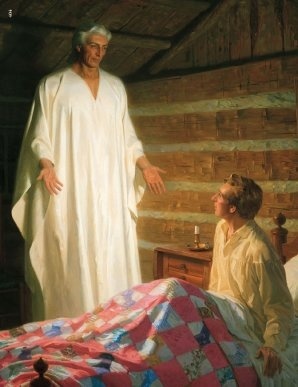 The angel Moroni speaking with young Joseph Smith in his bedroom, September 21, 1823. First let's review the ubiquitous claim that nothing is supposed to be added to the Bible. Deuteronomy 4:2 says "Ye shall not add unto the word which I command you, neither shall ye diminish ought from it, that ye may keep the commandments of the Lord your God which I command you." This is referring to the book of Deuteronomy, not the Bible, because the Bible didn't exist and wasn't going to be compiled until AD 367 a few years after the Council of Nicea and the formation of the Catholic Church. Revelation 22:18 says "For I testify unto every man that heareth the words of the prophecy of this book, if any man shall add unto these things, God shall add unto him the plagues that are written in this book." "This book" is still not the Bible, which still didn't exist, but the book of Revelation. Otherwise all of John's other books, which were written after this, would be blasphemy. Anyway, since the discovery and translation of the Book of Mormon were undertaken at God's command, it wasn't really man doing the adding. Or what about Galatians 1:6-9? "I marvel that ye are so soon removed from him that called you into the grace of Christ unto another gospel: which is not another; but there be some that trouble you, and would pervert the gospel of Christ. But though we, or an angel from heaven, preach any other gospel unto you than that which we have preached unto you, let him be accursed. As we said before, so say I now again, If any man preach any other gospel unto you than that ye have received, let him be accursed." That "angel" part seems particularly damning, but more on that at the end of this section. First of all, if we follow the critics' interpretation of "gospel" to mean all doctrines and practices of the Church, any scholar will tell you that mainstream Christianity is far removed from that of the early Apostles. More importantly, Paul is here condemning Peter and some others for continuing the practice of circumcision. Because the law of Moses was fulfilled by Jesus Christ, its external rituals were no longer necessary. To say they were was to dismiss Christ and preach "another gospel". Evangelical critics say that Latter-day Saints dismiss Christ by believing He wants us to do good works, but I address that in another section. Now, without further ado, Biblical references to the Book of Mormon and the Restoration of the Church. Genesis 11:9; "Therefore is the name of it called Babel; because the Lord did there confound the language of all the earth: and from thence did the Lord scatter them abroad upon the face of all the earth." The Bible offers no account of any of these people being scattered upon the face of the earth, but the Book of Mormon tells of the Brother of Jared and his pals who came to the Americas in a boat. Psalms 85:11; "Truth shall spring out of the earth; and righteousness shall look down from heaven." This is indeed what happened. The entire chapter of Isaiah 29 is about the Nephites speaking from the dust, the apostasy, restoration of the Gospel, and coming forth of the Book of Mormon. Several minor grammatical changes are made throughout by the Joseph Smith Translation, but nothing that changes the meaning. A few verses are of particular interest. Verse 4: "And thou [the Nephites] shalt be brought down, and shalt speak out of the ground, and thy speech shall be low out of the dust, and thy voice shall be, as of one that hath a familiar spirit, out of the ground, and thy speech shall whisper out of the dust." The Nephite civilization was destroyed by war, but the stories of its people were told with the discovery of the golden plates in the ground. Verse 11: "And the vision of all is become unto you as the words of a book that is sealed, which men deliver to one that is learned, saying, Read this, I pray thee: and he saith, I cannot, for it is sealed." When Martin Harris told Professor Charles Anthon about the golden plates, the latter said "that if I would bring the plates to him he would translate them. I informed him that part of the plates were sealed, and that I was forbidden to bring them. He replied, 'I cannot read a sealed book.'" Verse 12: "And the book is delivered to him that is not learned, saying, Read this, I pray thee: and he saith, I am not learned." This one doesn't correlate so neatly with a specific anecdote, but Joseph Smith, who received the golden plates, was certainly not learned, making it even more ludicrous to even entertain the notion that he could have possibly written this book himself. Verse 14: "Therefore, behold, I will proceed to do a marvellous work among this people, even a marvellous work and a wonder: for the wisdom of their wise men shall perish, and the understanding of their prudent men shall be hid." The work is none other than the coming forth of the Book of Mormon and the Restoration of God's Kingdom on the Earth. And it is indeed marvelous, in both the modern sense of the word and the archaic sense used here which meant supernatural. Ezekiel 37:15-19; "The word of the Lord came again unto me, saying, Moreover, thou son of man, take thee one stick, and write upon it, For Judah, and for the children of Israel his companions: then take another stick, and write upon it, For Joseph, the stick of Ephraim, and for all the house of Israel his companions: and join them one to another into one stick; and they shall become one in thine hand. And when the children of thy people shall speak unto thee, saying, Wilt thou not shew us what thou meanest by these? Say unto them, Thus saith the Lord God; Behold, I will take the stick of Joseph, which is in the hand of Ephraim, and the tribes of Israel his fellows, and will put them with him, even with the stick of Judah, and make them one stick, and they shall be one in mine hand." ​John 10:16; "And other sheep I have, which are not of this fold: them also I must bring, and they shall hear my voice; and there shall be one fold, and one shepherd." Some of these sheep He refers to are the Nephites of the American continent, and His visit to them is recorded in the Book of Mormon. Revelation 14:6-7; "And I saw another angel fly in the midst of heaven, having the everlasting gospel to preach unto them that dwell on the earth, and to every nation, and kindred, and tongue, and people, saying with a loud voice, Fear God, and give glory to him; for the hour of his judgment is come: and worship him that made heaven, and earth, and the sea, and the fountains of waters." Gordon B. Hinckley has revealed that this angel is none other than Moroni, who gave the golden plates to Joseph Smith. 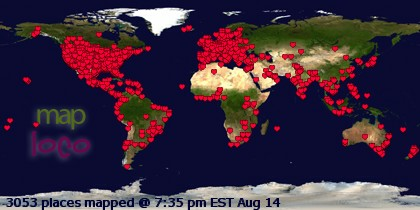 The Book of Mormon which came from those plates hasn't yet reached every nation, kindred, tongue and people, but it's getting closer every day. At one point there was even an unofficial outreach toward Klingons. Dennis K. Brown (author of "Evidences of the True Church") owned a French Catholic Bible from the seventeenth century, and in it the footnote to this verse says that the "everlasting gospel is a book to come forth". That was probably a lucky guess on their part, but it's interesting to see that mainstream Christians weren't always so dead set against the idea of God's Word coming from more than one source. So sad how things have changed. 1 John 4:1 likewise reads "Beloved, believe not every spirit, but try [test] the spirits whether they are of God: because many false prophets are gone out into the world." But then it elaborates on trying the spirits in the next two verses: "Hereby know ye the Spirit of God: Every spirit that confesseth that Jesus Christ is come in the flesh is of God: and every spirit that confesseth not that Jesus Christ is come in the flesh is not of God: and this is that spirit of antichrist, whereof ye have heard that is should come, and even now already it is in the world." Did Moroni confess that Jesus Christ is come in the flesh? In Joseph Smith History 1:34 "He also said that the fulness of the everlasting Gospel was contained in it, as delivered by the Savior to the ancient inhabitants..." In verse 40 "he quoted also the third chapter of Acts, twenty-second and twenty-third verses, precisely as they stand in our New Testament. He said that that prophet was Christ; but the day had not yet come when 'they who would not hear his voice should be cut off from among the people,' but soon would come." The book that Moroni was instrumental in bringing forth mentions Christ or His mission on average every 2.7 verses. I think this speaks for itself. (As a matter of fact, Moroni is a resurrected being rather than a spirit, and Satan has no resurrected beings on his side yet; but for the sake of argument it's fair to pretend he's a spirit.) Besides this, Satan's ability to transform himself into an angel of light is also referenced in the Book of Mormon (2 Nephi 9:9) and Doctrine and Covenants (129:8). Kind of odd if Joseph Smith was either unaware of this doctrine or didn't want anyone else to notice it.